1)In bread plan, add dough ingredients except butter & raisins. 3) at the end of program, divide dough into 12 - 16 pcs.shape each into a ball n place them 5cm apart in baking tray ( I used 13 x 9 inch for 16 rolls). Leave to rise in a warm place for 45 mins. 4) make the crosses - beat 4-5 tbsp water into 50g flour to make a paste. Pipe crosses on buns. 5) bake in preheated oven 220 deg cel for 13- 15 min till risen n golden. 6) Heat milk n sugar in a pan until sugar dissolves. 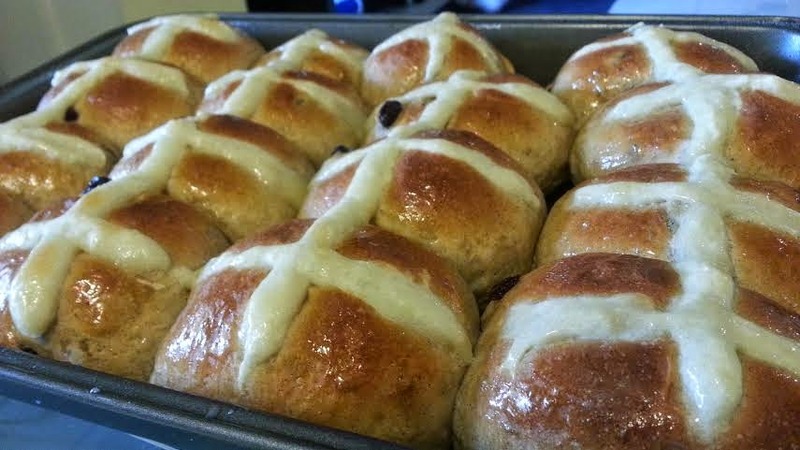 Bring to boil n brush over buns once they are out of the oven.